Is there any symbol more representative of classic beauty than a rose? I have been seduced by this stunner in our garden in British Columbia [see bottom]. She stands alone, majestic, velvety, radiant. Suddenly I want to photograph her, to paint my lips that color, to bathe in rose petals, to walk under arches of wild roses, to shop for vintage 90s Betsey Johnson velvet rose slip dresses, and stroll through these Parisian rose gardens. Roses hold a queenly status amongst flowers. They symbolize love and romance, tied in ancient Greek and Roman cultures to the goddess Aphrodite, hence rose’s reputation as an aphrodisiac. Different color roses gifted convey different meanings to the recipient. (Want to signify the death of a relationship? Black roses would be the subtle yet classy way out, instead of, say, ghosting.) My personal favorites are actually wild roses, because they climb and have a rogue, tousled air, compared to their pristine sisters. Rose growers come from far and wide to place their beloved varieties in rose competitions. It takes 10,000 pounds of Bulgarian roses to distill one pound of oil (at a precious $945 an ounce). And of course, roses are prime contenders for all things beauty. 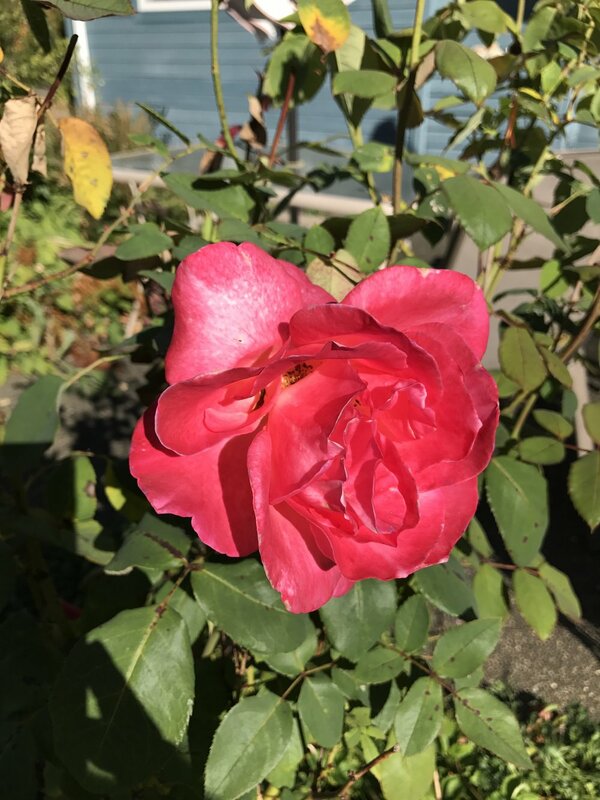 In Ayurveda, the essence of rose is considered uplifting, promoting happiness, compassion, decreasing stress, and calming tension. Rose products can also have a cooling effect, and so I especially love using them in summer. Let’s talk about my rose line up right now, because I love them not only in the garden, but also on my body. If you get my weekly Kindred Nuggets, you’ll know I love a rose water spritz. (If you aren’t getting these, scroll to the bottom of this page and sign up! It would mean the world to me, and I promise to deliver one very bite-sized email of growth-packed, life-beautifying things each weekend.) In the pink bottle, Heritage Store Rosewater Spray is incredibly cooling spritzed over face or body. Carry it with you when the weather is hot (or when you’re dancing, like I do), and it will instantaneously cool you down a bit. I also spray it on a clean face before applying products. 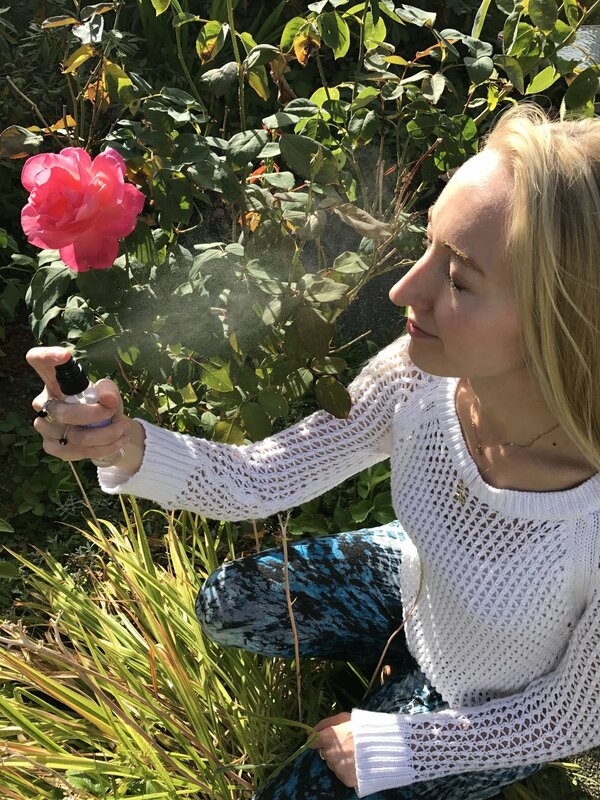 Here in British Columbia, I discovered Green Valley Aromatherapy’s rose hydrosol, which is slightly more intensely “rose-y” than the rosewater spray. Hydrosols are steam distillates, drawn from the steam of the essential oil in the aromatherapy still. I am quite devoted to essential oils and really believe they can affect physiology and mood. I put them in baths, use them at bedtime, for headaches, to stay alert in the car, and just diffuse them in the house. This one is called Blissful Heart, and every time I use it at home or on me, people comment and ask what it is. It has rose, geranium rose, jasmine, sandalwood, peppermint, lemon, and thyme. As much as I love the romance of perfume, I’ve all but stopped using synthetic scents, so I like to dab this on décolletage and behind my ears. It’s really uplifting. My once-oily skin has become much more combination in my 30s, and so I don’t powder all over like I used to. I love to amp up the dewiness on the highlight zones (cheekbones, cupid’s bow, inner corners of the eyes, the bridge of the nose, and a tiny bit on the chin), but I don’t want to be super shiny all over. I use this lovely, natural, Rose Silk Finishing Powder by Jurlique in select spots only — temple to temple along the hairline, on my nose, and around my mouth, places where shine tends to make you look oily instead of dewy. The other rose product that I grow absolutely cranky if I run out of is Glossier Milky Jelly Cleanser. It smells subtly of rosewater. Sometimes I actually exclaim out loud with pleasure in the shower when I use this. The texture is DIVINE -- cushy, soft, and yes, like jelly. It is extremely gentle at cleansing the face (I rub it all over my eyes too, with no sting) but does not feel like it leaves anything behind. One product I’m looking forward to trying come fall/winter, when my hands become obstinately dry: Grown Alchemist Intensive Hand Cream, Persian Rose & Argan Extract. Comes in a millennial pink metal tube. Perfect. My final swoon-worthy rose recommendation is that you listen to the hypnotically dulcet tones of Violette, French makeup artist, speaking in French while applying a bold lip in the breathtaking Chateau de Bagatelle rose gardens in Paris, complete with free-roaming peacocks. [Note: because of advertising/copyright policies on YouTube, it seems you may not be able to view this specific video on mobile devices. Head over to your laptop or desktop and it plays fine.] Now all I can think about is adding this magnificent site to my Paris bucket list. In the meantime, I’ll bathe in, wear, and smell like roses!